Elli's dance recital was on Saturday night. She has been taking classes at Roco for four years. This year she participated in a more advanced modern/jazz class that meets twice a week, vs. the other classes that meet once a week. What a difference double the practice makes! Elli's 3rd grade class performed with a 4th/5th grade class for the recital - 27 performers total. The dance was called Arabian Nights. The music was "Marco Polo" by Loreena McKennitt. They had their dance perfectly synchronized to the music, and each other. Elli performed her best leap ever. She did splits in the air - even she was amazed at how great it was. "I felt like I was flying!!" she said. Of course my little show-off added a little flying leap as she was exiting the stage, and going behind the curtain, which made the entire audience laugh. The Roco recital takes place on stage at the Civic Center in Marin. It's a big stage. 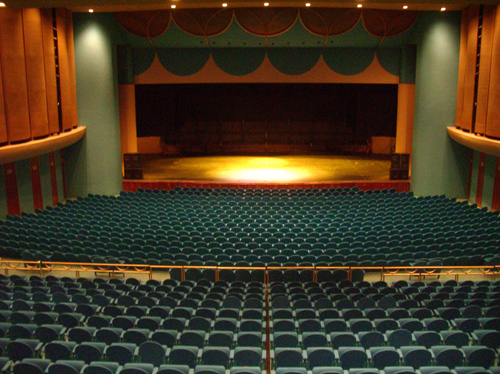 The auditorium seats 1,960 people and it's always just about sold out. So it's a pretty big deal. This is not like performing in the elementary school gymnasium or at your local community center. Last year Roco produced an amazing adaptation of Alice in Wonderland, called Alice. It was very modern, a bit surreal, but totally entertaining and something you would see in a professional theatre. Elli's class was in the performance - it was really cool to see the little girls perform with the teenagers. Here's a short clip I found on You Tube. Rumor has it that they will be performing Alice again next year. I hope so. I can't wait for Elli to be in it again. I overheard a woman at dinner talking about the show. She took her two young girls and was shocked at how "out there" it was. She takes her girls to ballet at the rec center, where the girls learn simple steps and wear big tutu's. She couldn't believe that there were teenagers in the show in contemporary costumes dancing to a Led Zeppelin music montage. It made me laugh listening to her. I can just imagine what she's used to and how she must have been expecting one thing - and saw something totally different. This is not Miss Priss's dance school with all the children dancing to classical music. Roco Dance school is really incredible choreography, and creative dancing, to great music. It's amazing. We love it. And most important, the kids love it. What an awesome school! I'm so glad she is continuing on our tradition of dancer's in the family!